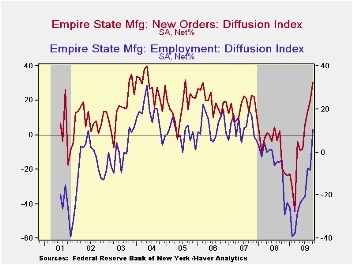 The Federal Reserve Bank of New York reported that its October Empire State Factory Index of General Business Conditions improved to its highest level since 2004. The latest reading of 34.57 compares to sharply negative levels this past Winter and suggests positive growth in factory sector activity. The latest level was much better than Consensus expectations for a reading of 18.0. The new orders component again paced the latest gain in the overall October index with a rise to the highest level since 2005. The shipments index also improved sharply while the employment index reached its highest level since 2007. In the history of the NY employment index, there has been an 87% correlation between the employment index and the three-month growth in overall U.S. factory sector employment as reported by the Labor Department. The workweek index also improved sharply as did unfilled orders and delivery times. The price index eased slightly after having risen to its highest level in a year during September. Nevertheless, the index level remained down sharply from all of last year. Since inception in 2001, there has been a 77% correlation between the index of prices paid and the three-month change in the core intermediate materials PPI. 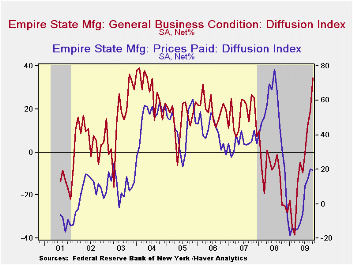 The Empire State index of expected business conditions in six months rose during August to its highest level since early 2007. The subseries for new orders, shipments, employment and capital expenditures each ticked up.